It is a real pleasure for me to join you this evening for the Creative Cities Collection - Fine Arts Exhibition London 2012. On behalf of the Chinese Embassy in the UK, I wish to extend my warm congratulations to this event. The opening of this exhibition here in London has special significance in three aspects. Firstly, it is a wonderful artistic contribution to the Thirtieth Olympiad. The founder of the modern Olympic movement, Pierre de Coubertin, always believed that Olympics should be a marriage of sports and arts. In the mind of Pierre de Coubertin, art and culture are always to be an integral part of Olympic programme. As one of the highlights of the Cultural Olympiad London 2012, this Exhibition has special characteristics. Creative Cities Collection - Fine Arts Exhibition is a critically important event to promote the Olympic spirit and spread the Olympic culture. It is also a best example of how art and sports can enhance each other. Secondly, this event is a tale of two cities. Both Beijing and London boast a long history and splendid culture. Both cities are making great efforts to develop cultural and creative industries. And the Olympic Games have created close bonds between these two creative cities. You may know that the theme of this exhibition is: ‘The River Thames, the Great Wall – Embrace the World.’ This is a superb and splendid subject. I really can’t find a more fitting one at this point in time. This theme denotes an Olympic cultural journey that explores from Beijing to London, and from the Great Wall to the River Thames. Thirdly, this event also symbolizes the warmest of greeting messages from Chinese artists and people to London and its Olympic Games. Visitors to the exhibition will have the opportunity to appreciate the finest works by more than one hundred artists. 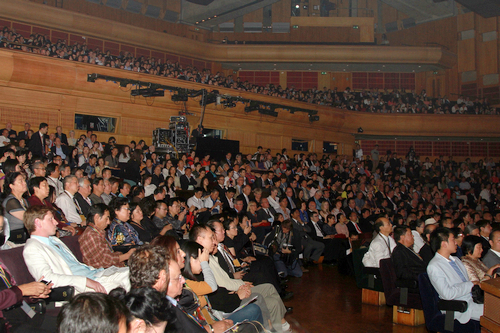 They are all among the most influential ones in modern China. These works speak volumes about Chinese artists’ untiring efforts in pursuit of the Olympic spirit. They also convey Chinese people’s best wishes for the success of the London Olympic Games. I have no doubt that arts will be a bridge of friendship connecting Beijing and London! 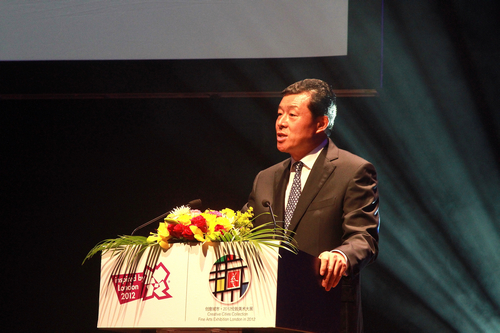 I have no doubt that the Olympic spirit will inspire continued progress of China-UK relations! 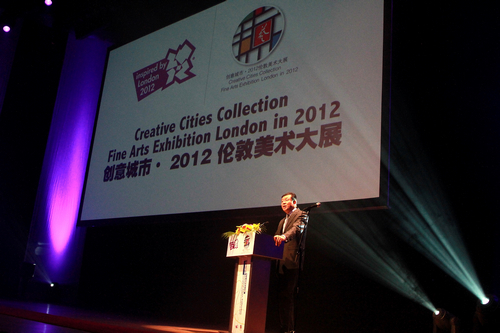 In conclusion, I wish Creative Cities Collection - Fine Arts Exhibition London 2012 a great success!